Whether you're looking for an old-fashioned country Bed and Breakfast stay as a way to show your children their family's rural heritage or as part of a comprehensive family enrichment and education process, at High Tower Ranch, you'll enjoy an authentic ranch-life experience from the ranch house to the barns to the hay fields. We've got it all - animals, chores, special homemade creations, cowboys, gardens, and more. Your family can pick the activities that best suit their interests and create vacation memories that will be cherished for a lifetime. We have playful goats, dogs, cats, horses, mules, cows, chickens and ducks. Children and goats enjoy climbing the low, broad-limbed trees around the ranch house. Chicken and duck eggs are collected every morning, preferably by our younger guests. After the baby goats are weaned, the nanny goats are milked every day. (We use the milk to make cheese.) All the critters in our care need to be fed at least once a day. The large garden has the typical assortment of Montana's seasonable vegetables including cabbages, broccoli, cauliflower, lettuce, tomatoes, chard, carrots, and potatoes, plus a few of Carol's horticulture experiments. Montana has a dry climate and some watering is done almost daily. In late summer, part of Carol's daily routine includes collecting produce for the day's meals and for canning and freezing. After the garden and barnyard chores are complete, Carol generally works on one of her projects such as sewing, making jams, breads or cheese, or creating something decorative for the house or yard. These projects are often easily integrated into activities for kids and adults of all ages. This is a special time for sharing traditional skills, telling stories and listening to young minds. Around the ranch, guests can watch the farrier put shoes on horses, help with the larger animals, or go for a horseback ride. Steve is always busy fixing a fence, tending a cow or horse, or improving the barns and stables. There is an abundance of wildlife near the ranch - deer, hawks, eagles, raccoons and, sometimes, skunks! In the evening, our guests can cheer on the local cowboys and cowgirls who gather for team roping events. Campfires are also a regular evening activity with Steve accompanying the sing-a-long on his guitar. Life at High Tower Ranch is fairly easy-going and kids are generally outside exploring and playing. We do insist that they abide by certain rules regarding safety. Most of our young guests don't have much experience with ranch animals, so we provide clear instructions and explanations. Steve and Carol have raised four children on ranches and have always enjoyed volunteering for a wide variety of children's activities. Steve is a retired high school vo-ag instructor. Carol has worked with children all her life. 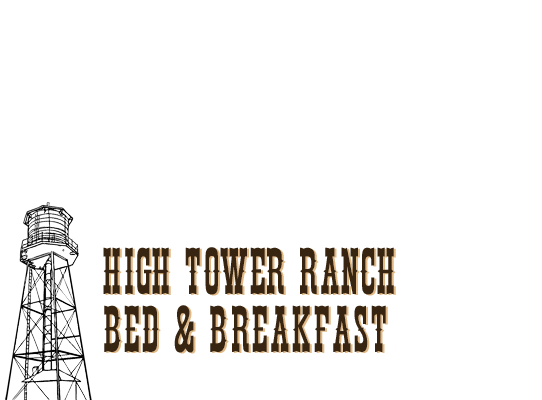 For details about making a reserving your stay at High Tower Ranch Bed & Breakfast, please visit our Contact page.